Countries of Southeast Asia will soon replace China as the world’s manufacturing superpower and become one of the planet’s most important trading blocs. A new report into the next 10 years of the Association of South East Asian Nations (Asean) found that the region’s youthful population, comparatively low labour costs, scope for productivity improvement and strategic location should propel it to being the world’s fifth largest economic area by 2025. Championing the idea of the Asean nations mimicking the path taken by their European counterparts, economists at Australian bank ANZ claim that within the space of a decade, Indonesia, Malaysia, Philippines, Singapore, Thailand, Brunei, Vietnam, Laos, Myanmar and Cambodia will become as important to Australia and New Zealand as China is now. Key to the optimism is the massive levels of infrastructure investment required across the region. It is estimated that Asean requires double the level of infrastructure spend that China committed to in the wake of the financial crisis. This will, according to ANZ, attract international investment worth US$106bn over the timescale, from around the world. Given the abundant key construction commodities found in Australia, a spate of projects even marginally close to these figures would be a massive boon to its economy, at a time when the buyers for iron ore and coal are thin on the ground. Furthermore, a growing middle class will acquire an appetite for the sorts of food exports coming from both Australia and New Zealand, while the Antipodes are likely to become large offtakers for the sorts of goods manufactured on the Asean production lines. “Over the same period, annual intra-regional trade could reach US$1tn and G4 trade – trade with the US, Europe, Japan and China – could reach US$3.7tn,” the authors wrote. 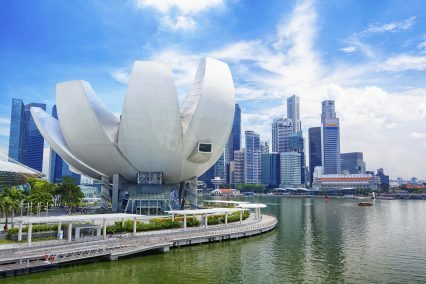 Singapore, it’s anticipated, would be the seat of the new empire, as it were, given the presence of international players and the advanced trading and business architecture to be found in the city state. Although infrastructure investment may present opportunities for the west, the huge gaps there are also one of the many challenges the region will face in fulfilling its potential. Another of these is the massive disparities from nation to nation. In Jakarta last week, GTR met with numerous trade figures who were keen to talk up the benefits of regional integration, but who also erred caution in lumping the Asean nations in together. For while there are economic discrepancies across Europe, EU and Eurozone economies are reasonably well-harmonised. And yet, the difficulties that came with creating an economic union there are being lived out before our eyes, with fears mounting over a “Grexit” on an almost daily basis. At a time at which new trade blocs and regions are seemingly de rigeur, it seems unfashionable to talk up the prospects of those which already exist. But while the potential for Asean may well be great, the political, social and economic challenges to achieving this are extremely large.